If you love zucchini as much as we do, then this recipe is for you! A stunningly beautiful seasonal pasta can be made by starting with a basic soffrito and adding shredded zucchini and zucchini blossoms. This is seasonal cooking at it’s finest because if you miss the window of opportunity, you miss it. Other recipes include stuffed blossoms with ricotta, Risotto (Risotto ai Fiori di Zucca), and pizza (as a topping)! 1. Cook pasta al dente; when adding the pasta to boiling water (salted) you can begin making the sauce. 2. Heat 3 tbsp olive oil in a sauce pan over medium-low heat. Add onion and minced garlic and slowly cook until the onions show signs of transparency (be careful not to burn the garlic, it will turn bitter). 3. before the garlic browns, add butter (optional) and let melt and then add the shredded zucchini and cook for a few moments. 4. When the pasta is almost ready, take one or two good ladles of the pasta water and add to the sauce, let come to a boil. The pasta water will help the sauce adhere to the pasta better. 5. When sauce is simmering toss in the zucchini flower blossoms. 7. 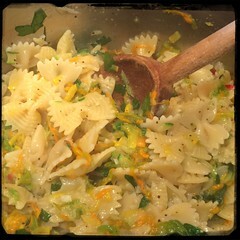 Drizzle with olive oil, chopped parsley and salt and pepper (to taste) and mix well. You can also add fresh ricotta along with the grated cheese!